The BR 500 professional backpack blower is a low-noise unit, thanks to its sound dampening material making it ideal for use in noise sensitve areas producing only 65 dB(A). 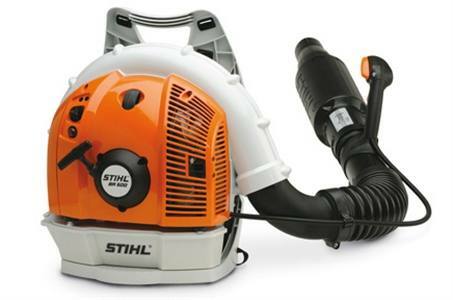 Powered by the fuel-efficient STIHL 4-MIX™ engine and a simplified starting procedure for single-handed operation, and an ergonomic mount for operator comfort, this unit sets new standards in the industry for a powerful yet ‘low-noise' backpack blower. STIHL 4-MIX® engine: You can always rely on STIHL to keep setting new benchmarks this time with 4-stroke mixed lubrication technology. The STIHL 4-MIX engine, which runs on a fuel-oil mix just like a 2-stroke, offers the benefits without the compromises of 4-stroke power. STIHL 4-MIX engine technology provides fast acceleration, more power, added torque, lower noise, reduced emissions and increased fuel efficiency to complete jobs quickly, quietly and more easily. Anti-vibration system: Intense vibration at the handles of power tools can lead to long-term effects on blood vessels in the hands and arms. STIHL has therefore developed an effective anti-vibration system whereby the oscillations from the machine's engine are dampened which significantly reduces vibrations at the handles. Built-in sound damper: The BR 500 with built-in sound damper is built for use in noise-sensitive areas. The measured noise reduction for the human ear is up to 59% compared to the previous model** Despite the relatively low noise emission, the BR 500 is a strong, reliable helper with high performance. **Measured according to EN-ISO22868. Multi-function control handle: Easy, comfortable thumb-operated control means the operator's hand never leaves the handle. 1) without fuel, complete 2) Newton is the force needed to accelerate 1 kg of mass at the rate of 1 m/sec2. 3) As per ANSI 175.2 standard The version(s) available in each country may differ from the above range and specifications; specific details may be subject to change without notice. Please ask your local STIHL Approved Dealer for further information.